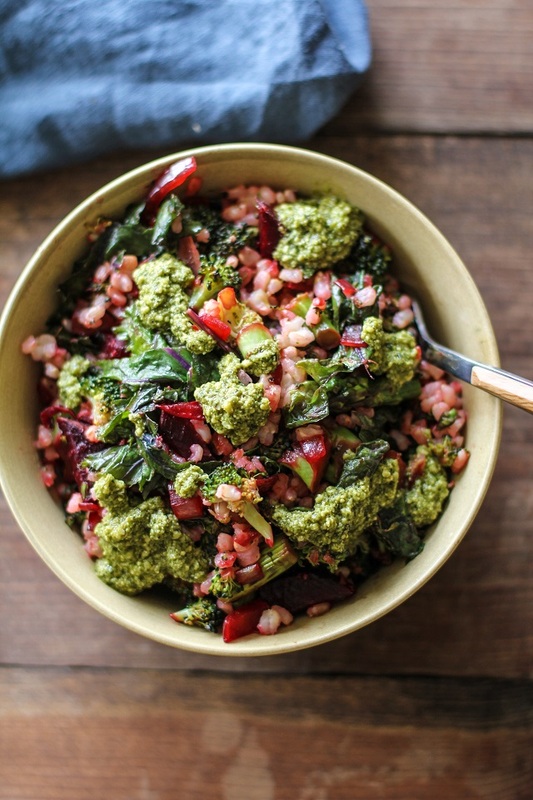 Brown rice pesto bowls with broccoli, beets, and kale – a superfood dinner that takes no time at all to prepare. This bowl is very telling. In fact, it’s a bit of a loud mouth. If this bowl could talk, it would usher you over and tell you it’s a perfect example of what I eat on the nightly. Glamourous? Hardly. Exhibit A. Exhibit B. Exhibit C. Exhibit D. Exhibit E (<-particularly Exhibit E). You see, on any given weeknight, come 5pm PST, my creative juices have dwindled, and I have hanger for a hot filling bowl of nutritious food. In order to avoid being a pantry pirate and making some real bad decisions, I’ve gotten into the habit of tossing loose odds and ends into a skillet and mix said ingredients with cooked rice and homemade or store-bought sauce. I will admit, sometimes said bowls are comprised of recipes deconstructed and re-purposed to fulfill my hankerings. I’ll periodically borrow the sauce from recipe A, the cooked veggies from recipe B, the meat from recipe C, give it all a little shake, add some salt and proceed to feed the food fiend. I know you’re wondering…does this bowl tastes like topsoil? I can confirm and solemnly swear that it does not. Here’s where you’ll just have to take a flying leap of the Trust Cliff and spread those wings, m’dear. Because it’s maaaahvelous. When in doubt, just add more pesto. If you’re plumb knackered at the end of the day, the veggies + rice (+ meat if you’re a carnivore) repertoire is pretty on point. It’s speedy quick and clean – your ultimate pantry piracy avoidance to keep your good decisions on track. 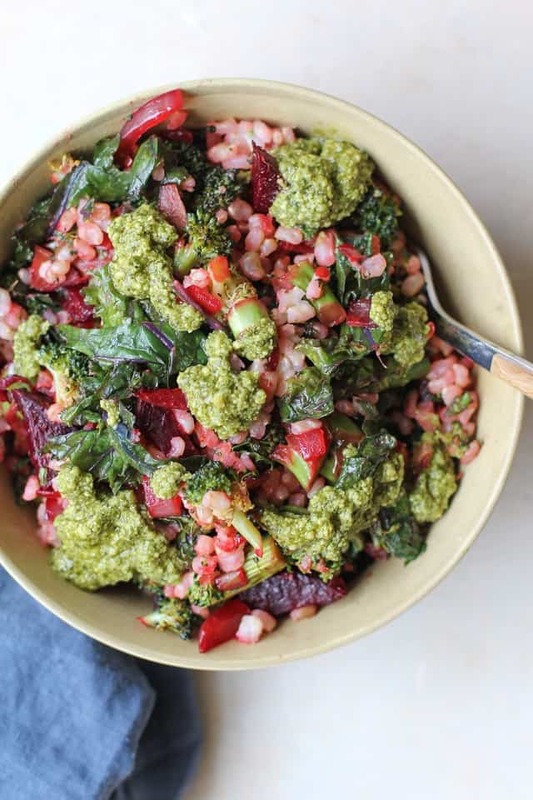 Red beets, broccoli, kale, red onion, and garlic are the main components of this recipe. Combined, these veggies award you a smattering of vitamins, minerals, and antioxidants. Saute those items up, throw in some cooked rice (or prepare the rice while the veggies are sauteeing), and mix in your favorite pesto sauce. 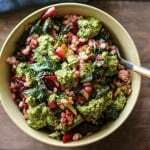 For this recipe, I used basil pesto sauce, but beet pesto or arugula pesto would be awesome as well! Need some protein? Just add chicken. Cook the rice according to package instructions. While the rice is cooking, prepare the veggies. Heat the oil over medium-high in a skillet or wok. Add the chopped beet, cover and cook, stirring occasionally, until beet turns bright red and begins to soften, about 8 minutes. Add the broccoli and red onion and replace the cover. Continue cooking, stirring occasionally until the broccoli turns bright green and has softened, about 5 to 8 minutes. Add the garlic and kale, cover, and cook until kale has wilted, about 2 minutes. Add the brown rice and pesto sauce and stir together well so that everything is combined and heated through. Taste the mixture for flavor and add sea salt to taste. Serve heaping bowls with additional pesto sauce to taste. “does it taste like topsoil?” hahaha! It sounds delightful to me! This looks SO good. Like, unreal. I can’t believe you somehow think this could ever NOT be glamorous, because I was drooling the moment I saw that pesto! But, maybe I’m biased, because this is exactly my kind of daily meal too 🙂 Pinning! hahaha oh gosh I do the same thing so often for dinner!! These sound sooo good!! I seem to always have extra beets and broccoli in the fridge …. so I so need to try these bowls out!! This looks so delicious and nutritious 😉 This is definitely my kind of food, I love broccoli and beetroot and the pesto sauce on top sounds perfect! YES! I love all this pink and green. I need to do a pesto veggie bowl ASAP! Your last-minute lack of creative juices looks a hellavuh lot better than mine! I usually resort to pizza and salad. But I much rather have a nutritious bowl of veggies like this. Bring on the pesto! I think pearl barley would be a nice swap to brown rice. I like its chewy structure when it is cooked. 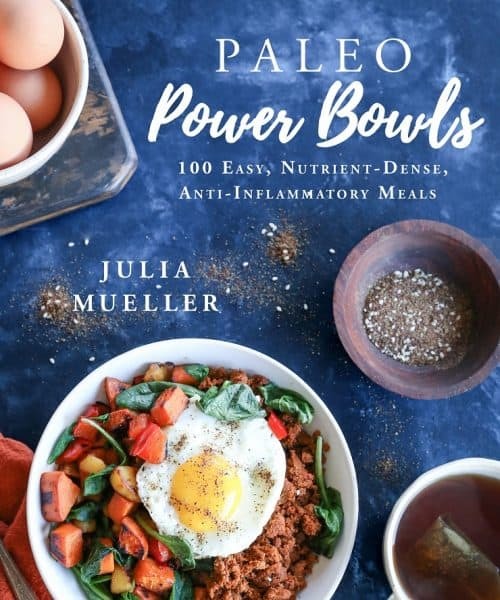 And also contains more more fiber than brown rice. Um, YES to post- 5pm exhaustion!! I really just need to make a big bowl of grains and a big bowl of beans on the weekend for random veggie bowls throughout the week. I feel like that would be a much better life choice than what I’ve been eating lately. Ahem.